“Would you like to go Sukhothai?” – this is the question that our generous Thai friend asked us the morning after our super adventure in North Thailand. He said that his parents are going to Sukhothai for a Rotary Club meeting and we will accompany them if we wanted to. Our answer, of course, is YES even if I didn’t know what kind of a place Sukothai is. I’ll go as long as it’s an adventure especially if it’s an adventure in Thailand. We spent almost the whole morning travelling along the winding road over the mountains and valleys. We reached Sukhothai town with empty stomachs so we dropped by a Sukhothai noodle soup restaurant for lunch. Our hosts intentionally brought us to this restaurant so we could taste the gastronomic pride of Sukhothai: Kuaytiaw Sukhothai which literally means Sukhothai-style noodles. I enjoyed Sukhothai’s noodles. The broth, the pork meat and the thin noodles are very good combination. We said our “thank yous” and “good byes” to Yam’s parents after the delicious lunch and off we go to the ruins of Sukhothai. The ruins are the remains of the once powerful Sukhothai Kingdom, which dominated Thailand during the 13th Century. The height of Sukhothai’s influence is due to Ramkhamhaeng, the third ruler of the kingdom. He expanded Sukothai’s territory by invading kingdoms in the Malay Peninsula, Myanmar, and Laos. 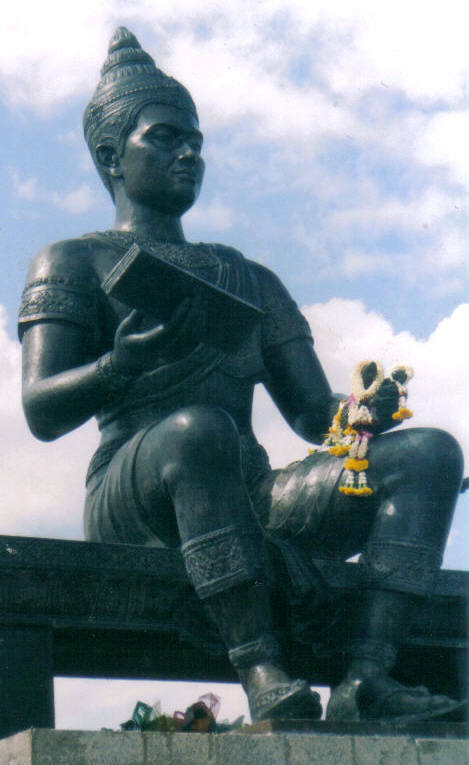 Ramkhamhaeng is still respected highly by the Thais so never make a mistake of making fun of his statue or insulting his name. In fact, some considered him as the Founding Father of the Thai Nation. The Sukhothai Historical Park occupies a very large rectangular area surrounded by walls. It is composed of 193 ruins of palaces, temples, and other structures. There are so many ruins to visit but we couldn’t visit them all so we just focused on a couple of major ruins of Sukhothai Kingdom. The first ruin that we visited is Wat Mahathat, which reminded me of the colossal ruins in Athens. Wat Mahathat is located at the heart of Sukhothai and considered as the main temple of the whole Kingdom. It once housed a bronze Buddha image which was transferred to Bangkok by King Rama I. Remaining stone Buddha in Wat Mahathat. The main feature of Wat Mahathat is its main stupa that looks like a lotus bud. At the base of this stupa is a relief of Buddha’s disciples. It seems that these disciples are dancing. The ruins are proof of the greatness of Sukhothai Kingdom. The old city has canal, dykes, dams and fortifications. Unfortunately, Sukhothai’s greatness ended with the death of Ramkhamhaeng. 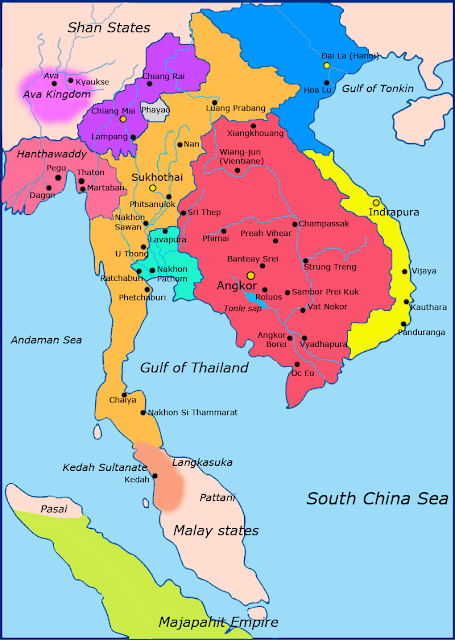 All of its vassal kingdoms broke away until it was invaded by the Kingdom of Ayutthaya. Compared to major tourist sites of Thailand that I visited, the old city of Sukhothai is the least crowded. I guess Sukhothai is too far away from Bangkok and few tourists dare to travel far. I am quite impressed with the ruins of Sukhothai especially because I came from a country that didn’t develop such kind of architecture. Our ancestors just used bamboos and wood as fortifications. We had to wait for the Spaniards for us to develop forts and structures made in stone. The ruins are not only thing that was left of Sukhothai Kingdom. The truth is that it created the Siam culture. The Thai alphabet, architectural styles, and even the Loi Krathong Festival traced their roots to Sukhothai Kingdom. This Kingdom is truly the “mother” of modern Thailand. So for history buffs like me, the visit to Sukhathai Kingdom is worth considering. One of my bucketlist, sobrang ganda ng place na to.. since elementary lagi kong binabasa ang history ng ASEAN county. At aside from that they really know and care about there heritage compare to us..
Tama ka. Proud kasi ang mga Thai sa heritage nila. Samantalang tayo puro negative ang comment regarding our Spanish past. Kaya imbes na maging proud tayo sa ating heritage ay tayo pa mismo ang sumisira ng mga iyon. Noodles look a bit like what we call kolo mee here. Nice! Lovely place, interesting history! The similarity is possible because noodles originated from China. wow.. sobrang ganda dito Ish.. sana makarating din ako..
Hawig nga sya sa Angkor Wat. Actually kumopya yung Sukothai ng ilang art style mula sa Khmers. Never been there and as you said, the travel time stops me from going. The annual Loy Krathong celebration is best observed in Sukhothai as it boasts of the best celebration during this festivity. It is a must see! Sayang naman. Sana makapunta ka din sa Sukhothai. Sana makabisita ka sa Thailand Lux para mapuntahan mo din itong Sukhothai. ang yaman mo na tlaga ish! hahahahahahha. Gusto ko matikman yung noodle, hay naku katakawan! Mayaman ka dyan. Office related to no. Sumimple lang ako ng gala kapag weekend at may free time.